His Eminence Most Reverend Athenagoras (Kavadas) of Thyateira and Great Britain (1884-1963) was the second Archbishop of Thyateira and Great Britain, from 1951 to 1962. The archdiocese is under the jurisdiction of the Church of Constantinople. Athenagoras Kavadas born in Corfu (Greece). He studied theology in Athens. In 1909, he was ordained deacon and priest in 1910. The same year he became the vice rector of the Rizarion Seminary, until 1917. In the 1918-1919 academi year, he studied in Oxford on a scholarship. 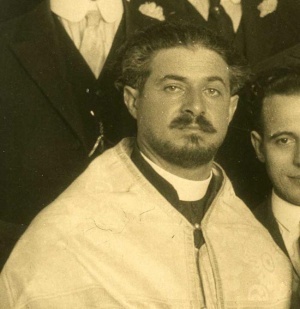 In 1921, he was called by Metropolitan Meletios (Metaxakis), who later became Ecumenical Patriarch, to America, where served several Greek parishes (Greek Orthodox Archdiocese of North and South America). He served at Holy Trinity Church in San Francisco, California for 1921 to 1927. After he was named vicar general of the Archdiocese of America. In 1937, he was appointed rector of "Holy Cross" Institute of Theology in Brookline (Boston) . In 1938, Fr. Athenagoras was consecrated Bishop of Boston, auxiliary bishop of the Archdiocese of America. That position he held until 1949. In 1951, he was appointed Archbishop of Thyateira and Great Britain, and Exarch of Western Europe, Ireland, and Malta (with his See in London). Abp. Athenagoras reposed in 1962. This page was last edited on April 1, 2016, at 20:16. This page has been accessed 9,490 times.